If you are struggling to structure your story, use The Story Pyramid. It guides you through the story. And we have a template for it! Storytelling. We all want to do it. It’s one of the most asked about topics in relation to marketing these days. Of course, it’s also a huge element of any presentation. It does wonders when you are speaking at a conference. And it’s a big asset when you are pitching or speaking in front of small groups. But creating a good story isn’t all that easy. Not everyone has the storytelling skills so it seems. There are a lot of elements that play an important role. In storytelling, having the right structure is crucial. Storytelling skills are important to have for any speaker. There are various ways to structure a story. They all have a beginning, middle, and end. But what structure is the best? One way to make sure you have the right structure is to use The Story Pyramid. What is the Story Pyramid? This method is often used for summarising. It also is useful as a tool to write, especially when it comes to business stories. Why is it called a ‘pyramid’? If you look at the storyline, it has a rhythm. You work up to a climax, followed by a falling point going towards the new situation. In the new situation, everything calms down. If you picture this, it looks like a pyramid. The Story Pyramid shows the structure of your story in one view. The Pyramid has 8 steps in three categories. The main categories are the start, the middle and the end of the story. In each step, you write down the essence of that step. At the beginning of the story, you introduce the characters. You explain the situation they are in and what conflict they need to overcome. In the middle part, you describe the ‘rising action’. This is what happens in the lead up to the climax. In the last part of the story, you describe the ‘falling point’. This is what happens after the climax and how your character takes action on the situation he or she is in. You then describe the resolution and you end with the new (successful) situation. Once you have written down the essence, you can start writing the details of the story. The Pyramid makes sure you have all the important elements embedded, in the right order. This way you are sure you have everything that makes a story interesting. In one overview, you show the storyline by writing down the key elements. The Pyramid has 8 steps divided into three categories. The main categories are the start, the middle and the end. In each step, you write down the essence of that step. In the New Situation, we see the new and improved situation. 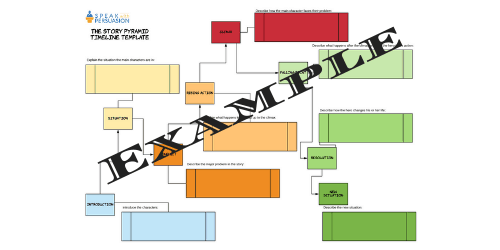 To help you structure, we’ve created a template to use this method. 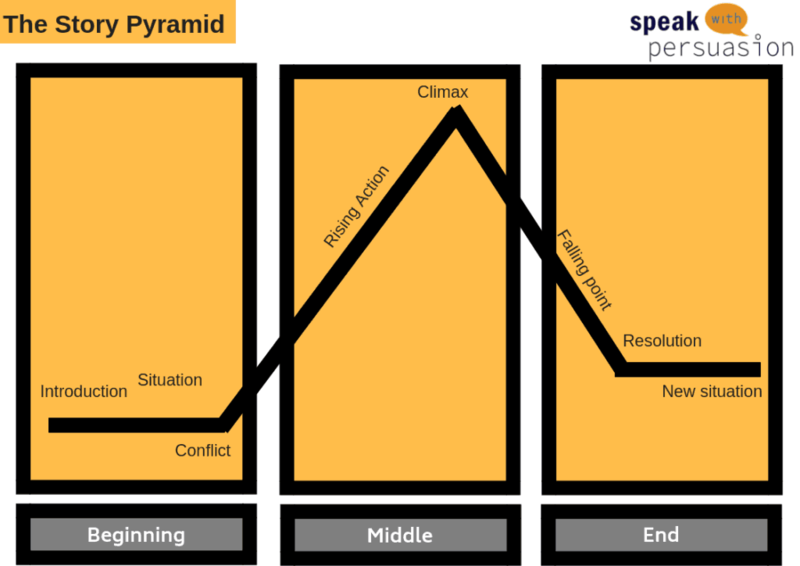 The Story Pyramid Template is a step by step approach to crafting your story. We guide you through the process. This WILL be useful to you! 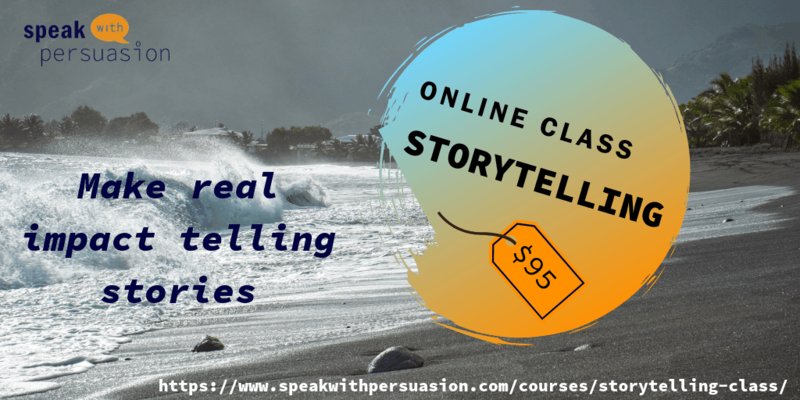 Your storytelling skills will get better! As a bonus: this method is not only great for using in your talks, you can use this method in your blogposts, in your social media and content marketing in general. You can even use it when writing a book or short story! And if you need any guidance or help, don’t hesitate to get in touch! Give us your name and email so we can send you the files of the template! When you get the template, you will as a bonus also receive a weekly FREE tip or insight on Public Speaking. Yes, send me the template and the tips!